I love spicy things and I love beer, so there's no reason I shouldn't like them together. Pepper / chili / spicy beers are one of those interesting novelties that I can enjoy every now and then, but probably won't ever want on a regular basis. The best case scenario for me is, happily, exactly what Fade to Black 3 shoots for — a dark, strongly flavored ale that holds up against the spiciness with complimentary flavors. Chili and chocolate go surprisingly well together. So while this isn't something I would buy a case of, it's one of the best examples I've seen from the style. Carbonation is light, allowing the flavors to hit your palate a bit more gently, staggering sweet and malty with roasty and spicy. The porter underneath is obviously a solid one, but it undergoes an evolution in your mouth from the spice — at first just a smoky, salty tang that compliments the roasted chocolate flavors, but within a second or so it's rushing across your tongue with a lingering, clinging burn. It's not overly aggressive, but the spice is what really sticks around, and you begin to forget the beer that came before it — though this has been true of every chili beer I've had. The heat is mostly just that: a warm burn that doesn't really have a particular flavor of its own, but still sort of blots out other flavors. The smooth, rich mouthfeel makes this a lot more drinkable than it might otherwise be. This is a pretty solid porter, and as good of a chili / pepper beer as you're likely to find. Within that style, this deserves very high marks, but it's a style that's sort of automatically handicapped — I can't see ever trying a chili beer that earns a spot as one of my all-time favorites. Availability: Limited, one-time release in an ongoing series. 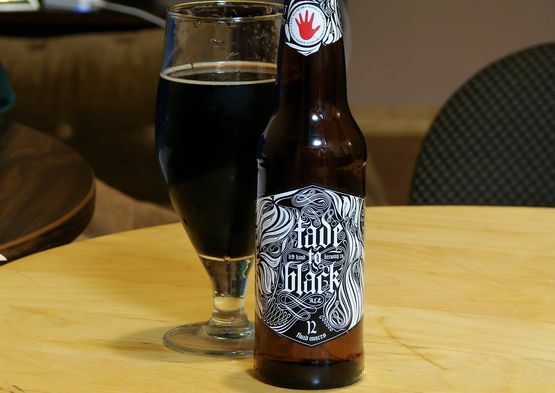 Every year Left Hand releases a different "volume" in its Fade to Black series, which will be a different dark beer each time. Available in sixpacks.